I Can’t Touch My Cellphone But People Can Drive Down the Freeway with Ladies’ Legs Sticking Out the Top of Their Cars?! Oregon has a new law forbidding the use of cellphones while driving. It’s extremely strict. In fact, it’s so strict that even thinking about touching your phone while driving is punishable by death. Okay, maybe not that strict, but darn close. The first offense is a big fat fine. The second offense is a bigger fatter fine, and the third offense (and I am not kidding) is punishable by up to six months in jail. You read that correctly. You can get tossed in the slammer for changing the music on your iTunes app. Our lawmakers were so concerned about the dangers of using a cellphone while driving, that they made the law apply to everyone. Absolutely everyone. No exceptions. Because, as I stated, it is so dangerous. Oh, wait a minute. There is ONE exception – police officers. Yeah. Big shocker, Oregon’s new law does NOT apply to cops. Apparently, cops undergo a rigorous training course that teaches them specialized techniques which enable them to safely drive while chatting on the phone with their girlfriends. 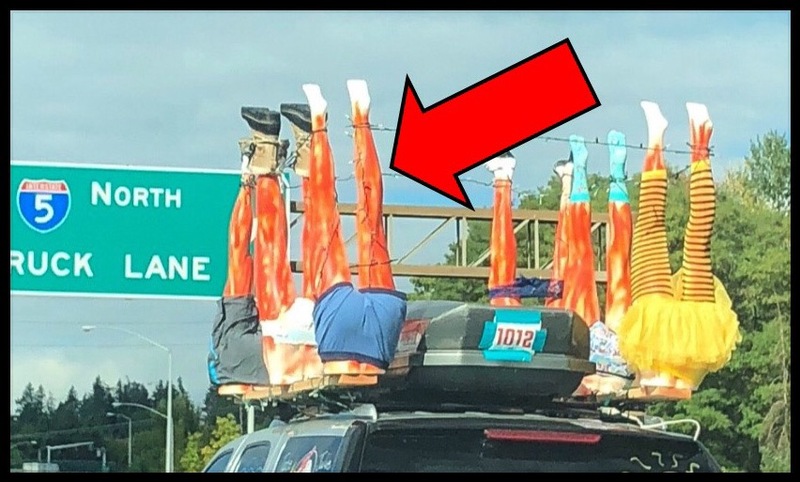 So, imagine my shock when my wife and I were heading north on Interstate 5 south of Portland yesterday when I spot a car with what appeared to be a bunch of women’s legs sticking out the top. I nearly had an accident yelling for my wife to take a picture of it, so that I could report this clear and present danger to you, the driving public. Even though I knew I was risking bodily death backing traffic up in the fast lane behind me while my wife snapped a picture. I felt it imperative to bring this disturbing transportational development to your attention. When I initially spotted the legs, my first impression was that they were all women’s legs. In retrospect, I think the bright yellow tutu on the right caught my attention. However, my astute wife, Julie, announced that a number of the legs appeared to be MEN’S legs! Upon further review, I think she’s right. 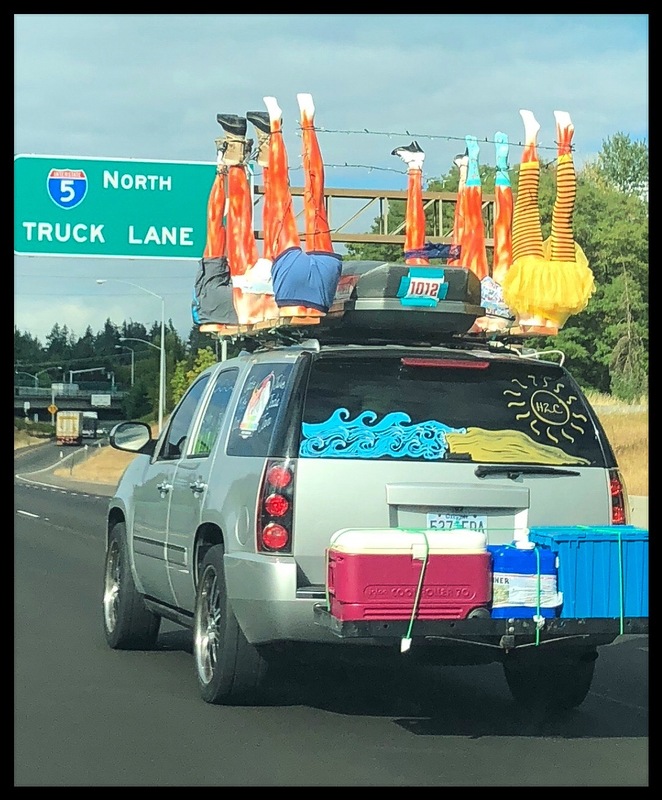 Here is Exhibit #1 – Now, I can understand why someone would find it beneficial to drive down the freeway with women’s legs sticking out of the top of their car, but I have to draw the line somewhere. No one, and I mean no one, should risk a multi-car pile-up over the revulsion of seeing a bunch of gross hairy men’s legs sticking out of the top of a car. It’s just wrong. I’m writing a letter to my state representative, and telling her that we need to amend our new cellphone law. We need to forbid, once and for all, allowing men’s legs to stick out the top of cars. And the penalty should be stiff. I suggest a mandatory minimum of six months in the slammer – PER HAIRY LEG!